Patriotic Theme at Denbigh Day! The event begins around 8:30 am with the cars and marching bands lining up at Denbigh High School. The parade route will take them north up Denbigh Boulevard towards Warwick Boulevard where it turns east on Old Courthouse Way and proceeds past the reviewing stand located at the festival site on the grounds of Courthouse Way Community Center. Then, down to Tabb's Lane where the route ends and the parade participants disembark. ​When the parade is over, the fun is just getting started. Check out what's new at the Denbigh Day Festival! NO LATER THAN 8:30 AM – details and parade application below. Sixty parade units and over twelve-hundred participants begin the march from Denbigh High School each year. With all the necessary fanfare included, they tromp and trudge, and skip and flip up Denbigh Boulevard in high style while the adoring Denbigh crowds cheer them on. Turning right onto Old Courthouse Way, parade participants proudly march past the reviewing stand to the applause of "Denbighites" assembled at the Courthouse Way Community Center (formerly Denbigh Early Childhood Center) at 14302 Old Courthouse Way, Newport News, VA - see map below. See the spectacle of the city’s fine marching bands from the area high schools, vehicles and floats, dance teams and little leaguers. It is Denbigh’s annual “rite of passage” for 58 years and you really don’t want to miss it. Download the official paper application and cover letter below or you may use the online submission function further below. Please review the application and cover letter thoroughly. Download the attached cover letter and parade application and follow the instructions on the forms to submit a paper application. ​Make checks payable to Denbigh Lions Club. Entries in the Denbigh Day Parade are free of charge. To place your entry online, fill out the information below, agree to the terms and click on submit prior to the deadline. We welcome you or your organization to participate in the parade. We are looking forward to colorful, patriotic, informative, interesting, and entertaining units that will delight the thousands who come to watch each and every year. Remember without your continuing support, there wouldn’t be a parade — so come and participate in this fun-filled day. TIME: Parade units may begin arriving at the assembly point at 8:30 a.m. and MUST be in place by 9:45 a.m. The parade will begin promptly at 10:00 a.m. ASSEMBLY POINT: Denbigh High School west parking lot (Enter via the east parking lot entrance, a SIGN will be displayed) Please make this information known to all of your participants. REVIEWING STAND: The reviewing stand will be located in front of the old Denbigh Early Childhood Center now the Courthouse Way Community Center at 14302 Old Courthouse Way. ANIMAL RESTRICTION: Animals, other than service animals, are not permitted in the parade. APPLICATION & REGISTRATION: Enclosed you will find the application necessary for registering your unit in the parade. All parade entries, WITH NO EXCEPTIONS, must return a parade application to reserve a space in the line-up and be eligible to participate. Furthermore, it is important that you return your application as soon as possible and before Monday, September 16, 2019 at midnight. Space in the assembly area is limited, therefore only the first 100 applications received will be eligible to participate. 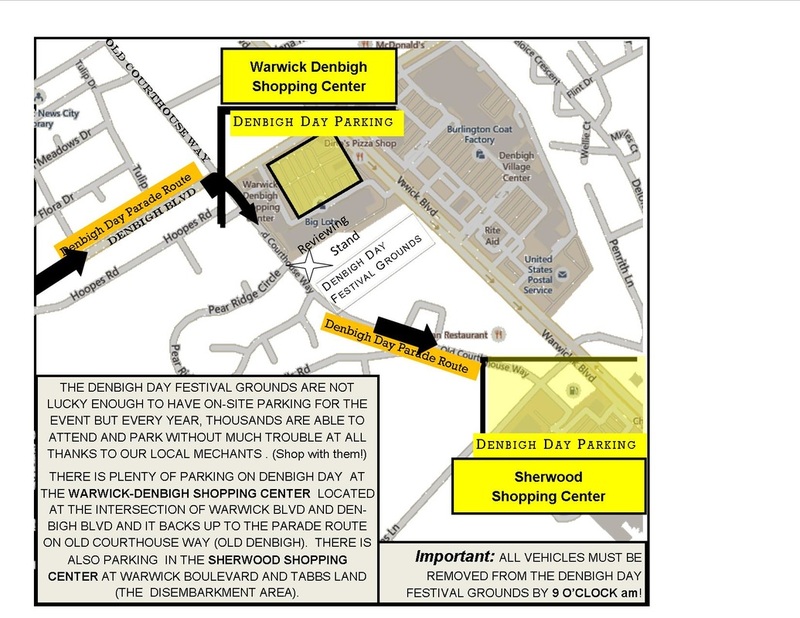 NOTE: The Denbigh High School west parking lot is reserved for parade units only, therefore, no parking will be allowed in this area. Please use the link below to contact me by e-mail. Arrival Time: Beginning at 8:30 a. m.
no later than 9:45 a. m.
Entries must be received by Monday, September 16, 2019 at midnight to be entered in the parade. All entries must submit an application (either paper or electronic) by the deadline to be entered in the parade. Don't put it off, the deadline is strict. I acknowledge with my signature below that the parade entry will not stop for demonstrations, counter-marches or otherwise unless the parade progress is stopped or told to do so by a Parade Marshall. I further understand that candy must not be thrown from floats or vehicles and leaflets, tracts or candy may only be handed to willing recipients.